Having played his whole life, and with a brother who’s played in the AHL, ECHL, and elsewhere, this friend of mine is more literate in hockey than me. He’s able to read hockey in an intuitive way that I’ve never been able to muster. I’ll look at stats and profiles, trying to find some evidence of the fluid game I enjoy in the static numbers and standings; he simply looks at the gait or shot of a young player and has a more nuanced read of his potential. I’m open to the idea that Karlsson can’t win the Norris this season, but the difference between my friend and I is that I attribute that to some sort of institutional bias. Shea Weber should have won last year, but Lidstrom did, as if the gesture were required as the penultimate recognition of an all-time great before an impending retirement. (Meanwhile, Lidstrom looks like he can play for another couple of seasons…) The thinking seemed to go that Weber would have his day to win the Norris, and that when it happened—which is to say, this season—it would be seen as the passing of the torch from one great defenceman to the next. And so I assumed that Weber would get his due, possibly at Karlsson’s expense, but that it wouldn’t be because of Karlsson. He leads defencemen in scoring by a country mile. He leads Shea Weber in CORSI. If it’s true that he has defensive liabilities as a result of his small frame, he far outweighs them (er…out-lights them?) with offensive contributions. He’s on the ice for more of his team’s goals than any other defenceman in the league. What we have is a philosophical question, and one that could have huge ramifications for a team gearing up to negotiate Karlsson’s next contract: is it more valuable to have a very, very good all-around player, or a player who is better than any other in the league in a few particular things? Because Karlsson isn’t just having a good season: offensively he’s dominating the league, and in a way that, at least this season, is putting him on another plane. The answer to that question is the difference between five and seven million dollars per year. The closest correlative is supposed to be Mike Green, a similarly offensively gifted player who is supposedly defensively stunted. In 2009-2010 he led defencemen in scoring with 76 points. But the point here isn’t that Karlsson will score close to the same number of points, it’s the distance by which he’s outpacing the competition. In 09/10, Duncan Keith was only seven points behind Green (although he played seven more games). In 2008-2009 Green led defencemen as well, with Andrei Markov nine points behind him with ten more games played. The gap was large, though not large enough to see Green lose to Norris. This season Karlsson is a whopping 17 points ahead of his next closest competition, Brian Campbell, is +14 to Campbell’s -9, and he’s doing it on a team most picked to finish bottom five in the league. He’s the team’s MVP, perhaps even responsible for their current playoff spot. If there’s a case to be made—and I think there is—it’s not only that Karlsson excels at one aspect of his position to a degree that no other player seems capable of matching, it’s the distance he’s put between himself and the rest of the pack. That he doesn’t play on the penalty kill on a team with Jared Cowen, Chris Phillips, Filip Kuba, Matt Carkner, Brian Lee, and other defencemen who seem better suited to it, seems like a strange reason to disqualify Karlsson from Norris consideration. But it still nags at me a little: those other defencemen are better suited, and this friend of mine, like I said, didn’t even hesitate to say Karlsson wouldn’t win it, and not only because it’s ‘not his turn’ but because he doesn’t deserve it. 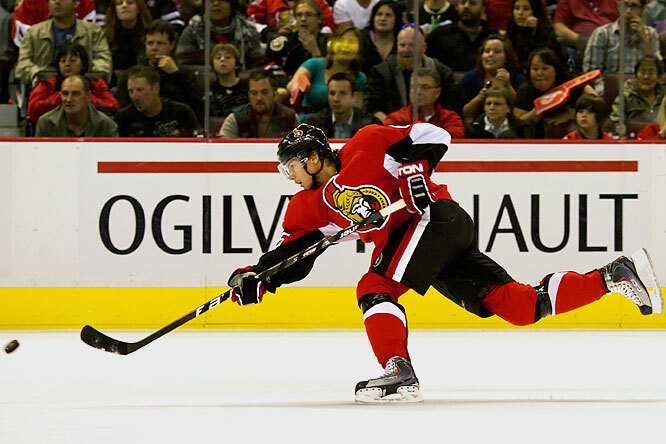 It seems like what we have is a recurring debate, one about the traditional conception of the responsibility and role of a defenceman versus the staggering reality of Karlsson’s incredible season. And so Ottawa is faced with their first big debate about the value of a defenceman since they got the Redden / Chara choice so, so wrong. I want to Doug weight in on this, but don’t have a lot of time becuase I think I’m in this office building for a reason and I should find out why, because it ain’t to read and comment on hockey blogs, I’m just going to write and not look back. Unfortunately, the norris trophy isn’t for best fourth forward, so the fact that he is having a stellar season because he can put the puck on net (and by the way, he takes an insane number of shots) just isn’t enough for a trophy, this isn’t the rocket richard trophy. The Norris is for all round defenseman. So, even though his plus/minus is on the exact opposite side of things from last year, so is the team. My big question is, if I was judging these sorts of things, which in the blog-a-square I am, would be is he getting the big minutes when the sens are up by only one with five minutes to play? Can he take control in the corners of the defensive zone and move the puck out well? Can he kill penalties? Can he shut down top lines? these are all things that you say yes to when you think Shea Weber, but when you think Karlesson aka Slickback swede? (Honest questions, I’m not bering sarcastic, not too well versed on my sens…) We know from this lovely article (not being sarcastic again, it’s a good read!) that he doesn’t kill penalties and that is pretty huge in terms of having serious defensive responsibilites. can he round out his game? The way things are going for him, I don’t doubt that he can’t, he’s a finalist for it this year for sure, and I think that whoever votes for these things are going to be hesitant(conservative) and look at his poor defensive past and decide against him. But for the future, I hope that he wins it as many times as eugene melnuyk’s incrediable tan wants, he deserves it. You’re probably right – his nomination will be award enough, in the eyes of the voters. I’m not sure what his ice time is in those crucial periods of the game, but he is playing something like 22-27 minutes a night, so odds are he’s out there almost the whole time.